Classic FAI & Burford Team Race. With grey skies and gusty winds, it was not among the best day’s racing we have had at CLAMF. Never the less, it is always enjoyable to be at the field with everyone and make some noise. Highlight of the day was Paul and Murray’s heat of 4.22. A great time under chilly, blustery conditions and with a Parra engine that is in less than perfect condition. We are now waiting on a supply of new engines and parts that hopefully will be available early in 2014. Also of note was Harry and Peter’s 4.40 heat with the familiar Sapavolov design. Harry also test flew his new Klotsnoruski model which handled the conditions well. Harry will have his one sorted when the Nats come round in early January. Ron Lacey arrived to watch and was promptly put to work pitting for both Murray in one heat and Ken Hunting in another. Ron will start to build a model as soon as a new batch of Parras arrive. Soon I hope. John Hallowell was saving his yellow Tiger and good Parra engine for the Nats and flew his Fora /orange Tiger model. While going fast in heat one, the integrated hub wheel came apart on landing and ended the chance of a good time. John won’t use those again! A compression adjustment meant a 4.59 in the next heat which is way slower than this models potential. 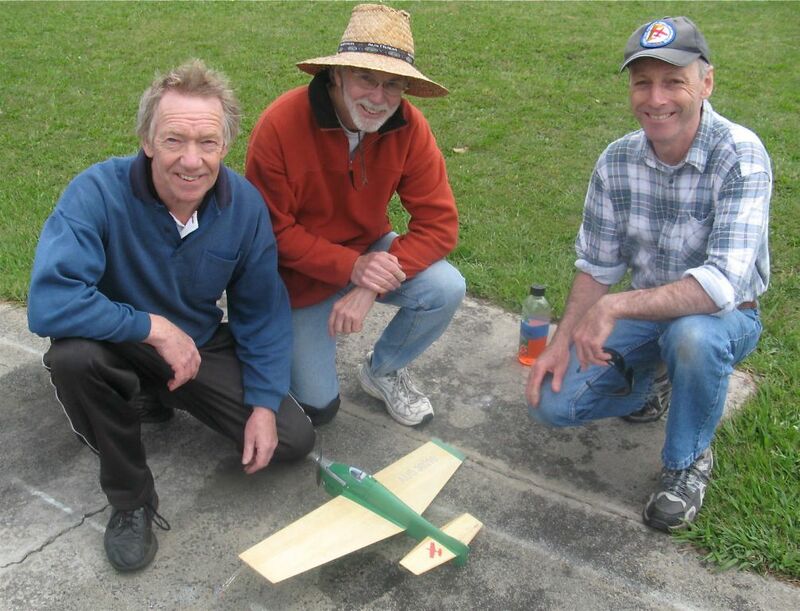 Mark and I flew my old Picus model with Marks Steel Parra up front. This is a tad slower than the AAC Parras and Foras used by the other teams on the day. Also Mark mentioned the spray coming from the front ball race area, not good when struggling for range. I will have my Orion with a new AAC P/L installed in the Parra soon . This will be ready to take First place at the nats. There you are!! A challenge has been thrown down. Good luck to all!! After some messing around we eventually finished a final race with Murray and Paul Stein taking the honours. Just shows that larger models like the Espadon are just as competitive as any other design. See you at the Nats !